You can never be too prepared. And thanks to five new fact sheets, APHA’s Get Ready campaign can help you, your family and community be even more ready for the worst. • Our new fact sheet on “go-bags” will help you learn why you need them and what to pack inside. You’ll also learn why it’s important to keep your emergency go-bags up to date. • In the case of a sudden disaster, help may not come right away. Our new general preparedness fact sheet has information on what you need to know to be prepared for many different types of disasters. • A few days of no rain isn’t so bad. But sometimes droughts are so severe that they turn into an emergency. Learn how to prepare for a drought and what to do when one is happening in your community. • You can get your family involved in preparedness too. 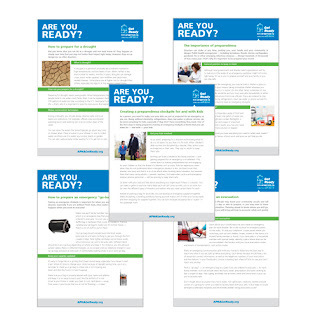 Our stockpiling with kids fact sheet shows easy ways children can help gather emergency supplies and make them feel ready for disasters. • If you had to drop everything and evacuate right now, would you be ready? Our new evacuation fact sheet helps you plan where to go, what to bring and how to prepare. 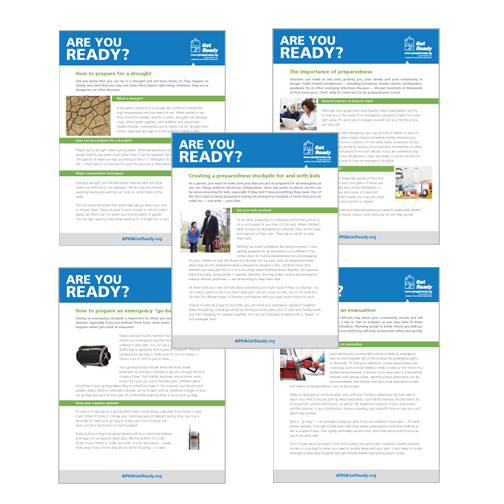 Get Ready fact sheets are perfect for sharing on campus, at the office, in the community or at home. There’s even space to add your logo. For the full lineup of fact sheets from Get Ready, including Spanish-language versions, check out our website.